And So It Is. . .
Oh how I wish I’d had my camera with me today! The parrot pictures here are not from real life, but they could have been if I’d remembered my camera! At a church rummage sale, I passed an older man, with long white hair and beard — carrying the most amazing parrot on his shoulder! 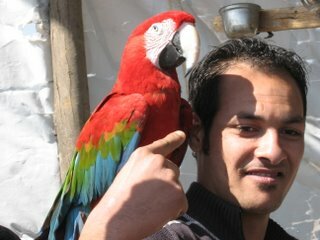 He was more blue than either of the parrots pictured, but equal in size to the one in the bottom photo. He had a long, elegant blue tail and piercing eyes. Very serene and regal, he just sat quietly and surveyed the silly humans shopping for bargains at the rummage sale. Just one of life’s little moments that made my day. And so it is. This entry was posted in Uncategorized and tagged bargains, birds, happiness, life, love, parrot, shopping, yard sales by octobia. Bookmark the permalink. Super-Duper site! I am loving it!! Will come back again – taking your feeds too now, Thanks.